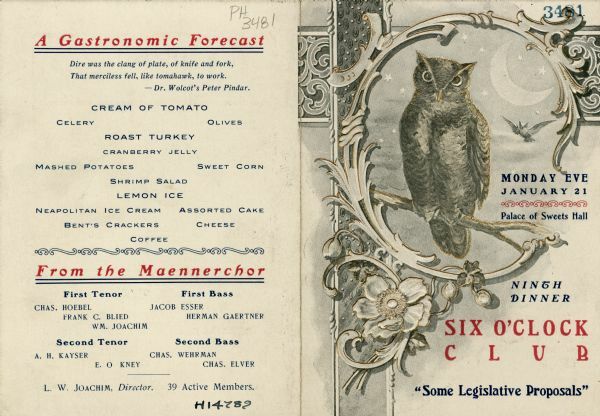 Back and front covers of the ninth dinner of the Six O'Clock Club, an organization that met several times a season to hear speakers on various civic issues. On the cover is an owl perched on a branch, framed by scrollwork accented with a flower in the lower left-hand corner. An owl in flight and a crescent moon in a starry sky hover in the background. Raised printing with gold accents and the name of the club in red ink. This was the fourth dinner of the 1900-1901 season, but the ninth Six O'Clock Club dinner overall (the first season from 1899-1900 consisted of five dinners). The Six O'Clock Club was a men's social and dining club, centered on topics of political and civic interest. See also Image IDs: 103636, 103640, 103723, 103782, 103784, 103797, 103798, 103802, and 103805 for other menus from the Six O'Clock Club.